Super Cheesy Chicken Enchilada Soup with Couscous. An easy weeknight dinner the whole family will love! 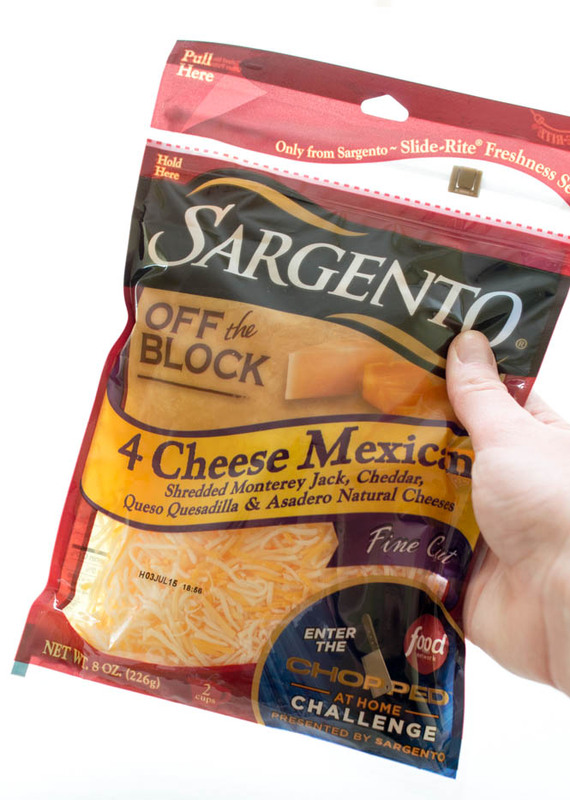 Sargento came up with a fun challenge for food bloggers and home cooks. The challenge is to come up with a creative and exciting dish featuring 4 main ingredients: chicken tenders, salsa, couscous and Sargento Off the Block 4 Cheese Mexican. At first I was thinking enchiladas and then my mind went to a casserole. I finally decided on soup. One of my favorite meals. 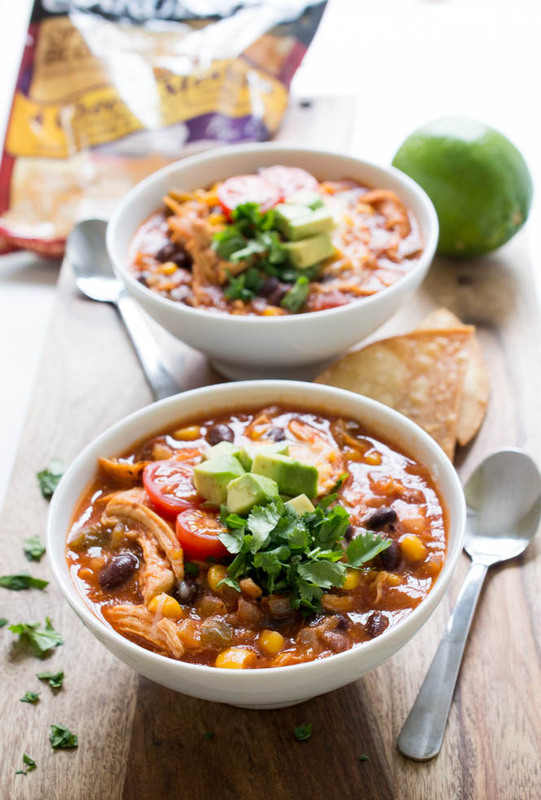 This soup is similar to my Easy 20 Minute Chicken Tortilla Soup but loaded with tons of cheese, salsa and couscous. 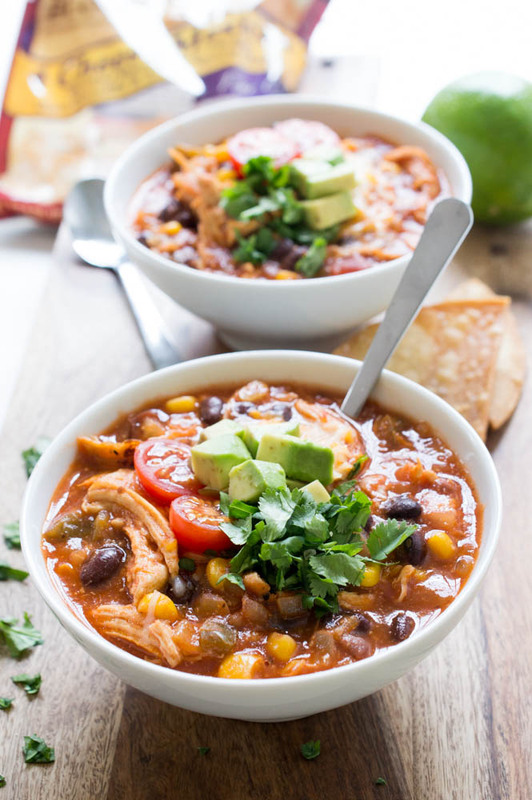 This Cheesy Chicken Enchilada Soup is loaded with all of my favorite Mexican flavors. Enchilada sauce, salsa, cilantro and lime juice. Slightly spicy and full of flavor. Warm, rich, creamy and very cheesy. Best of all this soup comes together in less than 30 minutes! I like to double this recipe and freeze any extra to have on hand for busy weeknight meals. This soup can be served as is or loaded with tons of your favorite toppings. I like to cook the couscous while my soup is simmering. 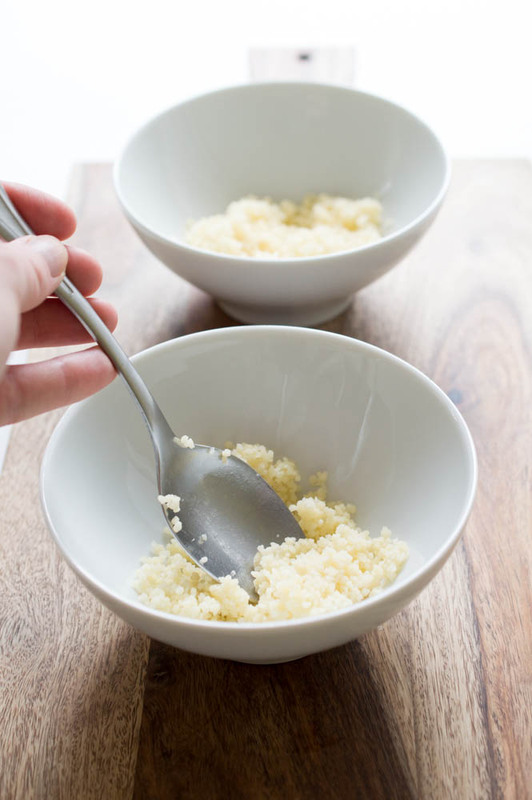 When serving the soup I spoon a couple spoonfuls of couscous into each bowl and ladle the soup on top. To make this soup extra rich and cheesy I used Sargento Off the Block 4 Cheese Mexican. Available in 30 versatile varieties, unique blends and distinct cuts, Sargento Shredded Cheese is always cut from blocks of 100% real, natural cheese. 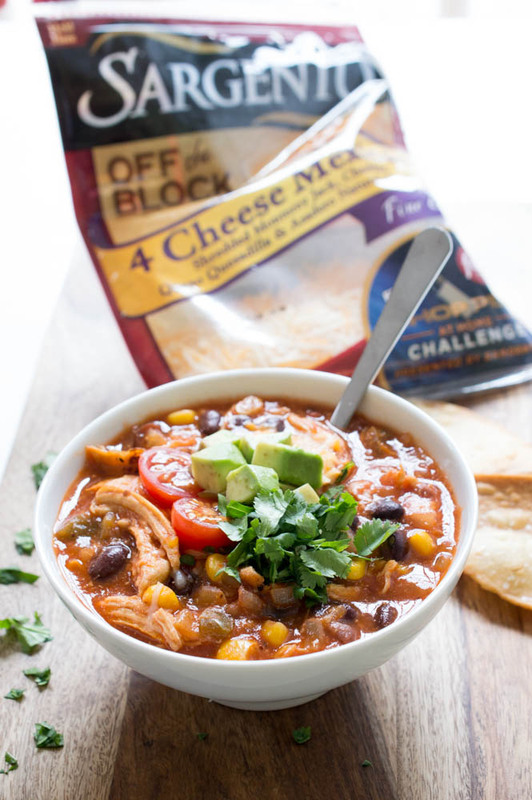 The Chopped at Home Challenge gives viewers a chance to create their best recipe using the selected basket ingredients, including Sargento Shredded Cheese, for a chance to win $10,000! What recipe would you submit to the Chopped At Home contest featuring Sargento cheese? Pour in chicken broth, enchilada sauce, crushed tomatoes, salsa, black beans, corn, cumin, paprika and pepper. Stir in precooked shredded chicken and warm through. Take off of the heat and add in cheese, lime juice and cilantro. To serve spoon couscous into the bottom of each bowl. Ladle soup on top and serve immediately. Garnish with avocado, cilantro, cheese and tomatoes if desired. I could do some damage to this delicious soup. I’m sure my family would love it too! This soup look so delicious! Can’t wait to try it with couscous! Love Sargento cheeses! What a fun and creative dish! We love Sargento cheese, it’s the only kind we buy! First of all, your pictures are GORGEOUS! I’m not the biggest fan of black beans (I know, what is WRONG with me?) but I think even if I left them out this would still be scrumptious. I love a good spicy soup! This soup looks perfect, Kelley! I love flavorful versions like this and the couscous is such a good idea! What a deliciou combination of ignredients. I bet it would be good with quinoa too. This looks delicious Kelley! I’m not really a soup lover but I would definitely use these flavors in a casserole- yum! I’m always in the mood for soup!! Love all the bold flavor in this! yuuummmmm! I LOVE that you put couscous in this enchilada soup! What a fun twist! Made this tonight, and it was amazing! Very flavorful and has a kick; perfect for a fall evening. Thanks for a great recipe.